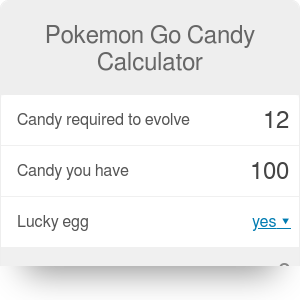 Pokemon Go candy calculator allows you to maximize your pokemon evolutions in the popular Pokemon Go game. Pokemon Go was definitely one of the biggest hits of Summer 2016 and you certainly must have noticed that. Millions of players were (and still are) strolling the streets looking for their next Pokemon, hatching eggs and fighting other players in the gyms. Many players went on another level and started creating tutorials and tools aiming to help players level up their characters. One of these tools is our Pokemon Go Candy calculator which can help you figure out how many Pokemons you can evolve. In the first field insert the amount of candies required to level up your Pokemon. Those can range from 12 for the likes of Pidgey or Caterpie to even 400 for the famous Magikarp. Popular strategy for leveling up suggests you choose one of the 12-candy ones to maximize your outcome. Why? For every Pokemon you evolve, you get 500 experience points. So whether you evolve 1 Magikarp or 33 Pidgeys - you still get 500 points. So it makes a lot of sense to go for the least demanding ones. In the next field insert the amount of candies you have. Finally, in the third field choose whether you'll be using Lucky Egg on this occasion. Lucky Egg is an item you can find in the game that doubles you experience gained over half an hour (30 minutes) period. Don't use them to evolve just one or two Pokemons, instead keep them in your inventory and use only once you accumulate many more Pokemons and candies. Once you're ready, use the egg and you'll get 1000xp for each upgrade. Hurry up because it won't last for long! If you're into Pokemon Go, feel free to also check out our other tool that tells you how much weight you could lose by playing the game. Pokemon Go Candy can be embedded on your website to enrich the content you wrote and make it easier for your visitors to understand your message.